The Strait of Hormuz (/hɔːrˈmuːz/ Persian: تنگه هرمز‎ Tangeye Hormoz listen (help·info)) is a strait between the Persian Gulf and the Gulf of Oman. It provides the only sea passage from the Persian Gulf to the open ocean and is one of the world's most strategically important choke points. On the north coast lies Iran, and on the south coast the United Arab Emirates and Musandam, an exclave of Oman. At its narrowest, the strait has a width of 21 nautical miles (39 km). 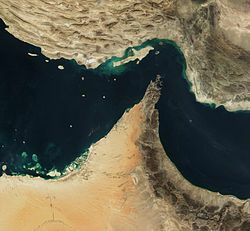 The Strait of Hormuz separates Iran to the north and the Musandam Governorate of Oman and the United Arab Emirates to the south. About 20% of the world's petroleum (about 35% of the petroleum traded by sea) passes through the strait, making it a highly important strategic location for international trade. At the upper end of these Calaei islands is a range of mountains called Calon, and there follows not far beyond, the mouth of the Persian Gulf, where there is much diving for the pearl-mussel. To the left of the straits are great mountains called Asabon and to the right there rises in full view another round and high mountain called Semiramis; between them the passage across the strait is about six hundred stadia; beyond which that very great and broad sea, the Persian Gulf, reaches far into the interior. At the upper end of this gulf there is a market-town designated by law called Apologus, situated near Charaex Spasini and the River Euphrates. In the 10th–17th centuries AD, the Kingdom of Ormus, which seems to have given the strait its name, was located here. Scholars, historians and linguists derive the name "Ormuz" from the local Persian word هورمغ Hur-mogh meaning date palm. [dubious – discuss] In the local dialects of Hurmoz and Minab this strait is still called Hurmogh and has the aforementioned meaning. The resemblance of this word with the name of the Persian god هرمز Hormoz (a variant of Ahura Mazda) has resulted in the popular belief[neutrality is disputed] that these words are related. Jodocus Hondius labels the Strait Basora fretum ("Strait of Basra") on his 1606 map of the Ottoman Empire. To reduce the risk of collision, ships moving through the Strait follow a Traffic Separation Scheme (TSS): inbound ships use one lane, outbound ships another, each lane being two miles wide. The lanes are separated by a two-mile-wide "median". To traverse the Strait, ships pass through the territorial waters of Iran and Oman under the transit passage provisions of the United Nations Convention on the Law of the Sea. Although not all countries have ratified the convention, most countries, including the U.S., accept these customary navigation rules as codified in the Convention. In April 1959 Iran altered the legal status of the strait by expanding its territorial sea to 12 nautical miles (22 km) and declaring that it would recognize only transit by innocent passage through the newly expanded area. In July 1972, Oman also expanded its territorial sea to 12 nautical miles (22 km) by decree. Thus, by mid-1972, the Strait of Hormuz was completely "closed" by the combined territorial waters of Iran and Oman. 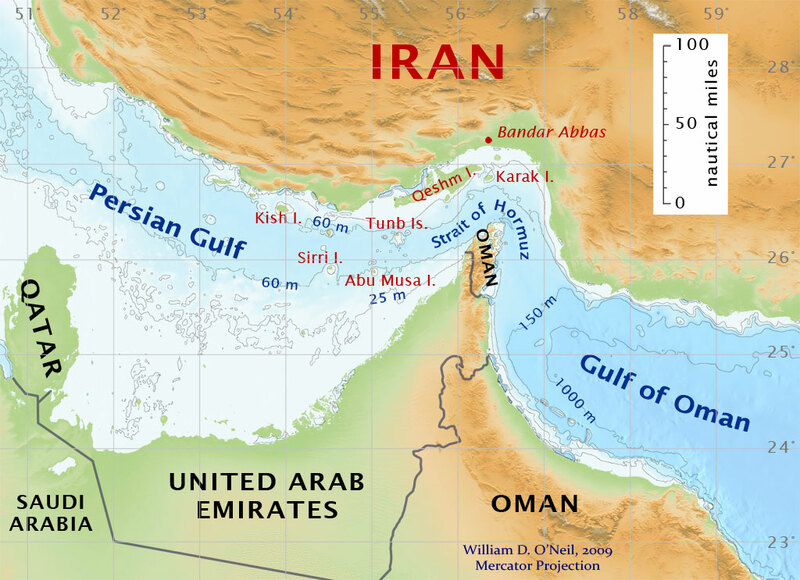 During the 1970s, neither Iran or Oman attempted to impede the passage of warships through the strait, but in the 1980s, both countries asserted claims that were different from customary (old) law. Upon ratifying UNCLOS in August 1989, Oman submitted declarations confirming its 1981 royal decree that only innocent passage is permitted through its territorial sea. The declarations further asserted that prior permission was required before foreign warships could pass through Omani territorial waters. Upon signing the convention in December 1982, Iran entered a declaration stating “that only states parties to the Law of the Sea Convention shall be entitled to benefit from the contractual rights created therein”, including “the right of transit passage through straits used for international navigation”. 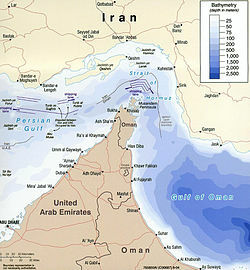 In May 1993, Iran enacted a comprehensive law on maritime areas, several provisions of which conflict with UNCLOS provisions, including a requirement that warships, submarines, and nuclear-powered ships obtain permission before exercising innocent passage through Iran’s territorial waters.The United States does not recognize any of the claims by Oman and Iran and has contested each of them. Oman has a radar site Link Quality Indicator (LQI) to monitor the TSS in the Strait of Hormuz. This site is on a small island on the peak of Musandam Governorate. A 2007 report from the Center for Strategic and International Studies also stated that 17 million barrels passed out of the Persian Gulf daily, but that oil flows through the Strait accounted for roughly 40% of all world-traded oil. According to the U.S. Energy Information Administration, in 2011, an average of 14 tankers per day passed out of the Persian Gulf through the Strait carrying 17 million barrels (2,700,000 m3) of crude oil. This was said to represent 35% of the world's seaborne oil shipments and 20% of oil traded worldwide. The report stated that more than 85% of these crude oil exports went to Asian markets, with Japan, India, South Korea and China the largest destinations. The Tanker War phase of the Iran–Iraq War started when Iraq attacked the oil terminal and oil tankers at Iran's Kharg Island in early 1984. Saddam's aim in attacking Iranian shipping was, among other things, to provoke the Iranians to retaliate with extreme measures, such as closing the Strait of Hormuz to all maritime traffic, thereby bringing American intervention. Iran limited the retaliatory attacks to Iraqi shipping, leaving the strait open. On 18 April 1988, the U.S. Navy waged a one-day battle against Iranian forces in and around the strait. The battle, dubbed Operation Praying Mantis by the U.S., was launched in retaliation for the USS Samuel B. Roberts striking a mine laid in the channel by Iran on 14 April. U.S. forces sank one frigate, one gunboat, and up to six armed speedboats, as well as seriously damaging a second frigate. On 3 July 1988, 290 people were killed when an Iran Air Airbus A300 was shot down over the strait by the United States Navy guided missile cruiser USS Vincennes (CG-49) when it was identified as a jet fighter. Flight 655 had taken off from a joint Iranian Military/Civilian airfield and the IFF (Identification Friend or Foe) signals being received had two ID codes, one for a civilian aircraft and one for a fighter. Leading some experts to speculate that at least one and possibly more fighter aircraft were hiding in flight 655's "radar shadow". Such a tactic is quite effective against older radar systems but much less so against the Spy 1 radar which CG-49 was equipped with. The shoot-down is still clouded in misinformation and controversy even decades later. On 8 January 2007, the nuclear submarine USS Newport News, traveling submerged, struck MV Mogamigawa, a 300,000-ton Japanese-flagged very large crude tanker, south of the strait. There were no injuries, and no oil leaked from the tanker. A series of naval stand-offs between Iranian speedboats and U.S. warships in the Strait of Hormuz occurred in December 2007 and January 2008. U.S. officials accused Iran of harassing and provoking their naval vessels, but Iranian officials denied the allegations. On 14 January 2008, U.S. Navy officials appeared to contradict the Pentagon version of the 16 January event, in which the Pentagon had reported that U.S. vessels had almost fired on approaching Iranian boats. The Navy's regional commander, Vice Admiral Kevin Cosgriff, said the Iranians had "neither anti-ship missiles nor torpedoes" and he "wouldn't characterize the posture of the US 5th Fleet as afraid of these small boats". On 29 June 2008, the commander of Iran's Revolutionary Guard, Mohammad Ali Jafari, said that if either Israel or the United States attacked Iran, it would seal off the Strait of Hormuz to wreak havoc in the oil markets. This followed more ambiguous threats from Iran's oil minister and other government officials that an attack on Iran would result in turmoil in the world's oil supply. 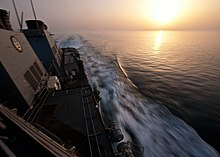 Vice Admiral Kevin Cosgriff, commander of the U.S. 5th Fleet stationed in Bahrain across the Persian Gulf from Iran, warned that such Iranian action would be considered an act of war, and the U.S. would not allow Iran to hold hostage nearly a third of the world's oil supply. On 8 July 2008, Ali Shirazi, a mid-level clerical aide to Iran's Supreme Leader Ayatollah Ali Khamenei, was quoted by the student news agency ISNA as telling the Revolutionary Guards, "The Zionist regime is pressuring White House officials to attack Iran. If they commit such a stupidity, Tel Aviv and U.S. shipping in the Persian Gulf will be Iran's first targets and they will be burned." In the last week of July 2008, in the Operation Brimstone, dozens of U.S. and foreign naval ships came to undergo joint exercises for possible military activity in the shallow waters off the coast of Iran. As of 11 August 2008, more than 40 U.S. and allied ships reportedly were en route to the Strait of Hormuz. One U.S. carrier battle group from Japan would complement the two which are already in the Persian Gulf, for a total of five battle groups, not including the submarines. On 20 March 2009, United States Navy Los Angeles-class submarine USS Hartford collided with the San Antonio-class amphibious transport dock USS New Orleans in the strait. The collision, which slightly injured 15 sailors aboard Hartford, ruptured a fuel tank aboard New Orleans, spilling 25,000 US gallons (95 m3) of marine diesel fuel. On 27 December 2011, Iranian Vice President Mohammad-Reza Rahimi threatened to cut off oil supply from the Strait of Hormuz should economic sanctions limit, or cut off, Iranian oil exports. A U.S. Fifth Fleet spokeswoman said in response that the Fleet was "always ready to counter malevolent actions", whilst Admiral Habibollah Sayyari of the Iranian navy claimed that cutting off oil shipments would be "easy". Despite an initial 2% rise in oil prices, oil markets ultimately did not react significantly to the Iranian threat, with oil analyst Thorbjoern Bak Jensen of Global Risk Management concluding that "they cannot stop the flow for a longer period due to the amount of U.S. hardware in the area". On 3 January 2012, Iran threatened to take action if the U.S. Navy moves an aircraft carrier back into the Persian Gulf. Iranian Army chief Ataollah Salehi said the United States had moved an aircraft carrier out of the Gulf because of Iran's naval exercises, and Iran would take action if the ship returned. "Iran will not repeat its warning...the enemy's carrier has been moved to the Gulf of Oman because of our drill. I recommend and emphasize to the American carrier not to return to the Persian Gulf", he said. The U.S. Navy spokesman Commander Bill Speaks quickly responded that deployment of U.S. military assets would continue as has been the custom stating: "The U.S. Navy operates under international maritime conventions to maintain a constant state of high vigilance in order to ensure the continued, safe flow of maritime traffic in waterways critical to global commerce." While earlier statements from Iran had little effect on global oil markets, coupled with the new sanctions, these comments from Iran are driving crude futures higher, up over 4%. Pressure on prices reflect a combination of uncertainty driven further by China's recent response – reducing oil January 2012 purchases from Iran by 50% compared to those made in 2011. The U.S. led sanctions may be "beginning to bite" as Iranian currency has recently lost some 12% of its value. Further pressure on Iranian currency was added by French Foreign Minister Alain Juppé who was quoted as calling for more "strict sanctions" and urged EU countries to follow the US in freezing Iranian central bank assets and imposing an embargo on oil exports. On 7 January 2012, the British government announced that it would be sending the Type 45 destroyer HMS Daring to the Persian Gulf. Daring, which is the lead ship of her class is one of the "most advanced warships" in the world, and will undertake its first mission in the Persian Gulf. The British Government however have said that this move has been long-planned, as Daring will replace another Armilla patrol frigate. On 9 January 2012, Iranian Defense Minister Ahmad Vahidi denied that Iran had ever claimed that it would close the Strait of Hormuz, saying that "the Islamic Republic of Iran is the most important provider of security in the strait... if one threatens the security of the Persian Gulf, then all are threatened." The Iranian Foreign Ministry confirmed on 16 January 2012 that it has received a letter from the United States concerning the Strait of Hormuz, "via three different channels." Authorities were considering whether to reply, although the contents of the letter were not divulged. The United States had previously announced its intention to warn Iran that closing the Strait of Hormuz is a "red line" that would provoke an American response. Gen. Martin E. Dempsey, the chairman of the Joint Chiefs of Staff, said this past weekend that the United States would "take action and re-open the strait,” which could be accomplished only by military means, including minesweepers, warship escorts and potentially airstrikes. Defense Secretary Leon E. Panetta told troops in Texas that the United States would not tolerate Iran's closing of the strait. Nevertheless, Iran continued to discuss the impact of shutting the Strait on world oil markets, saying that any disruption of supply would cause a shock to markets that "no country" could manage. By 23 January, a flotilla had been established by countries opposing Iran's threats to close the Hormuz Strait. These ships operated in the Persian Gulf and Arabian Sea off the coast of Iran. The flotilla included three American aircraft carriers (the USS Carl Vinson, the USS Enterprise and USS Abraham Lincoln) and three destroyers (USS Momsen, USS Sterett, USS Halsey), seven British warships, including the destroyer HMS Daring and a number of Type 23 frigates (HMS Westminster, HMS Argyll, HMS Somerset and HMS St Albans), and a French warship, the frigate La Motte-Picquet . On 24 January, tensions rose further after the European Union imposed sanctions on Iranian oil. A senior member of Iran's parliament said that the Islamic Republic would close the entry point to the Gulf if new sanctions block its oil exports. "If any disruption happens regarding the sale of Iranian oil, the Strait of Hormuz will definitely be closed," Mohammad Kossari, deputy head of parliament's foreign affairs and national security committee, told the semi-official Fars News Agency. On April 28, 2015, IRGCN patrol boats contacted the Marshall Islands-flagged container ship Maersk Tigris, which was westbound through the strait, and directed the ship to proceed further into Iranian territorial waters, according to a spokesman for the U.S. Defense Department. When the ship's master declined, one of the Iranian craft fired shots across the bridge of Maersk Tigris. The master complied and proceeded into Iranian waters near Larak Island. The US Navy sent aircraft and a destroyer, USS Farragut, to monitor the situation. Maersk says they have agreed to pay an Iranian company $163,000 over a dispute about 10 container boxes transported to Dubai in 2005. The court ruling allegedly ordered a fine of $3.6 million. In July 2018, Iran again made threats to close the strait. Citing looming American sanctions after the U.S withdrew from the JCPOA deal earlier in the year. Iran’s Revolutionary Guards reported they were ready to carry out the action if required. In August 2018, Iran test-fired ballistic missile for first time in 2018. According to the officials, the anti-ship Fateh-110 Mod 3 flew over 100 miles on a flight path over the Strait of Hormuz to a test range in the Iranian desert. “It was shore-to-shore,” said one U.S. official describing the launch, who like the others requested anonymity to discuss sensitive information. Millennium Challenge 2002 was a major war game exercise conducted by the United States armed forces in 2002. According to a 2012 article in The Christian Science Monitor, it simulated an attempt by Iran to close the strait. The assumptions and results were controversial. A 2008 article in International Security contended that Iran could seal off or impede traffic in the Strait for a month, and an attempt by the U.S. to reopen it would be likely to escalate the conflict. In a later issue, however, the journal published a response which questioned some key assumptions and suggested a much shorter timeline for re-opening. In December 2011, Iran's navy began a ten-day exercise in international waters along the strait. The Iranian Navy Commander, Rear Admiral Habibollah Sayyari, stated that the strait would not be closed during the exercise; Iranian forces could easily accomplish that but such a decision must be made at a political level. Captain John Kirby, a Pentagon spokesman, was quoted in a December 2011 Reuters article: "Efforts to increase tension in that part of the world are unhelpful and counter-productive. For our part, we are comfortable that we have in the region sufficient capabilities to honor our commitments to our friends and partners, as well as the international community." In the same article, Suzanne Maloney, an Iran expert at the Brookings Institution, said, "The expectation is that the U.S. military could address any Iranian threat relatively quickly." General Martin Dempsey, Chairman of the Joint Chiefs of Staff, said in January 2012 that Iran "has invested in capabilities that could, in fact, for a period of time block the Strait of Hormuz." He also stated, "We've invested in capabilities to ensure that if that happens, we can defeat that." In a July 2012 Foreign Policy article, Gal Luft compared Iran and the Strait of Hormuz to the Ottoman Empire and the Dardanelles, a choke point for shipments of Russian grain a century ago. He indicated that tensions involving the Strait of Hormuz are leading those currently dependent on shipments from the Persian Gulf to find alternative shipping capabilities. He stated that Saudi Arabia was considering building new pipelines to Oman and Yemen, and that Iraq might revive the disused Iraq–Syria pipeline to ship crude to the Mediterranean. Luft stated that reducing Hormuz traffic "presents the West with a new opportunity to augment its current Iran containment strategy." In June 2012, Saudi Arabia reopened the Iraq Pipeline through Saudi Arabia (IPSA), which was confiscated from Iraq in 2001 and travels from Iraq across Saudi Arabia to a Red Sea port. It will have a capacity of 1.65 million barrels per day. In July 2012, the UAE began using the new Habshan–Fujairah oil pipeline from the Habshan fields in Abu Dhabi to the Fujairah oil terminal on the Gulf of Oman, effectively bypassing the Strait of Hormuz. It has a maximum capacity of around 2 million barrels per day, over three-fourths of the UAE's 2012 production rate. The UAE is also increasing Fujairah's storage and off-loading capacities. The UAE is building the world's largest crude oil storage facility in Fujairah with a capacity of holding 14 million barrels to enhance Fujairah's growth as a global oil and trading hub. The Habshan – Fujairah route secures the UAE's energy security and has the advantage of being a ground oil pipeline transportation which is considered the cheapest form of oil transportation and also reduces insurance costs as oil tankers would no longer enter the Persian Gulf. ^ Viktor Katona. "How Iran Plans To Bypass The World's Main Oil Chokepoint". Oilprice.com. Retrieved 2018-09-11. ^ a b "The Strait of Hormuz is the world's most important oil transit chokepoint". U.S. Energy Information Administration. 4 January 2012. Retrieved 11 September 2018. ^ a b c d e Groves, Steven (2011-08-24). "Accession to the U.N. Convention on the Law of the Sea Is Unnecessary to Secure U.S. Navigational Rights and Freedoms". The Heritage Foundation. Retrieved 2017-04-09. ^ Municipality of Minab, (in Persian). Retrieved 30 December 2011. ^ a b Alejandra Roman & Administration. "Strait of Hormuz". The Encyclopedia of Earth. Retrieved 2015-06-02. ^ "Chronological lists of ratifications of, accessions and successions to the Convention and the related Agreements as at 26 October 2007". Division for Ocean Affairs and the Law of the Sea. UN. ^ U.S. President Ronald Reagan (10 March 1983). "Presidential Proclamation 5030" (PDF). United States Department of State. Retrieved 21 January 2008. ^ a b c Karsh, Efraim (25 April 2002). The Iran–Iraq War: 1980–1988. Osprey Publishing. pp. 1–8, 12–16, 19–82. ISBN 978-1-84176-371-2. ^ Dorsey, Jack (10 January 2007). "Navy says speed of tanker sucked submarine up to surface". The Virginian Pilot. ^ Isenberg, David (10 January 2008). "A game of chicken in the, Persian Gulf". Asia Times Online. Retrieved 8 January 2012. ^ "U.S. Navy Commander Warns Iran: Don't Try Closing Gulf Oil Passageway". Fox News. 2 July 2008. Archived from the original on 20 October 2012. Retrieved 2 December 2018. ^ "Iran to "hit Tel Aviv, U.S. ships" if attacked". Yahoo News. 8 July 2008. Archived from the original on 16 July 2008. ^ "JTFEX 08-4 "Operation Brimstone" Flexes Allied Force Training". US Navy. 15 July 2008. ^ "Three major US naval strike forces due this week in Persian Gulf". Debkafile. 11 August 2008. ^ "U.S. Navy vessels in Bahrain for evaluation after collision". CNN. 20 March 2009. Archived from the original on 13 January 2012. Retrieved 8 January 2012. ^ "Oil jumps over 2% as Iran threatens supplies". CNN. 27 December 2011. ^ "US warns Iran over threat to block oil route". BBC News. 28 December 2011. Retrieved 8 January 2012. ^ Gibbons, Robert (28 December 2011). "Oil falls on dollar's rise, Wall Street pullback". Reuters. Retrieved 8 January 2012. ^ Hafezi, Parisa (3 January 2012). "Iran threatens U.S. Navy as sanctions hit economy". Reuters. Retrieved 8 January 2012. ^ "Iran nuclear crisis: Sanctions 'beginning to bite'". BBC News. 3 January 2012. Retrieved 8 January 2012. ^ "State Department: Iran is feeling the pressure - Yahoo! News". Ca.news.yahoo.com. 3 January 2012. Archived from the original on 9 January 2012. Retrieved 24 January 2012. ^ Harding, Thomas (6 January 2012). "Royal Navy sends its mightiest ship to take on the Iranian show of force in the Gulf". The Telegraph. London. Retrieved 8 January 2012. ^ "Iran and the Strait of Hormuz". Tabeer. Archived from the original on 29 July 2013. ^ "News Headlines". Cnbc.com. 16 January 2012. Retrieved 24 January 2012. ^ Bumiller, Elisabeth; Schmitt, Eric; Shanker, Thom (12 January 2012). "U.S. Warns Top Iran Leader Not to Shut Strait of Hormuz". The New York Times. ^ Smith, Grant (16 January 2012). "Oil Climbs From Four-Week Low as Iran Warns of Hormuz Supply Disruption". Bloomberg. ^ "Iran: Flotilla Of Warships Sent Through Strait of Hormuz Heightens Tensions". Huffington Post. 23 January 2012. Retrieved 24 January 2012. ^ "Iran: EU oil sanctions 'unfair' and 'doomed to fail'". BBC. 23 January 2012. Retrieved 24 January 2012. ^ Blair, David (23 January 2012). "Iran threatens to close Strait of Hormuz over EU oil sanctions". The Daily Telegraph. Retrieved 27 January 2012. ^ "Iran seizes commercial ship, U.S. forces respond". CNN. 28 April 2015. Retrieved 28 April 2015. ^ "Maersk insists on release of ship and crew seized by Iran". Reuters. 30 Apr 2015. ^ Dehghan, Saeed Kamali (5 July 2018). "Iran threatens to block Strait of Hormuz over US oil sanctions". the Guardian. ^ "Iran's Guards say Strait of Hormuz is for all or". Reuters. Reuters. Retrieved 6 July 2018. ^ "Iran test-fires ballistic missile for first time in 2018, officials say". FoxNews. Retrieved 12 August 2018. ^ Peterson, Scott (26 January 2012). "How Iran could beat up on America's superior military". www.csmonitor.com. ^ "Iranian navy begins exercise in waters near strategic oil route". China Daily. 26 December 2011. Retrieved 8 January 2012. ^ "Shutting Off Gulf 'Very Easy': Iran Navy Chief". CNBC. Reuters. 28 December 2011. Archived from the original on 24 September 2015. Retrieved 8 January 2012. ^ Hunter, Kathleen; Gienger, Viola (8 January 2012). "Iran Has Ability to Block Strait of Hormuz, U.S. General Dempsey Tells CBS". Bloomberg. Retrieved 9 January 2012. ^ a b c Luft, Gal (19 July 2012). "Choke Point". www.foreignpolicy.com. Retrieved 6 August 2012. ^ "New UAE pipeline bypasses Strait of Hormuz". www.aljazeera.com. 15 July 2012. Retrieved 27 July 2012. ^ "World's largest crude oil storage facility to be built in UAE". Khaleej Times. 27 February 2019. ^ Gulf News (6 March 2019). "The UAE's longer term approach on energy security". Wise, Harold Lee (2007). Inside the Danger Zone: The U.S. Military in the Persian Gulf 1987-88. Annapolis: Naval Institute Press. ISBN 1-59114-970-3. Diba, Bahman Aghai (2011). Is Iran legally permitted to close Strait of Hormuz to countries that impose sanctions against Iran's oil?. Cupertino, California: Payvand Iranian-American Website. Waehlisch, Martin. The Iran-United States Dispute, the Strait of Hormuz, and International Law. The Yale Journal of International Law Online, Vol. 37 (Spring 2012), pp. 23-34. Archived from the original on 25 August 2012. 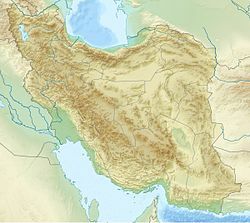 Wikimedia Commons has media related to Strait of Hormuz. "Strait of Hormuz": links to various resources, including antique maps. 1580-pixel-wide excerpt from "Strait of Hormuz – U.K. Admiralty Chart 2888"